What’s next for Vikings? Variety reports season four of the History series will return with new episodes in November. 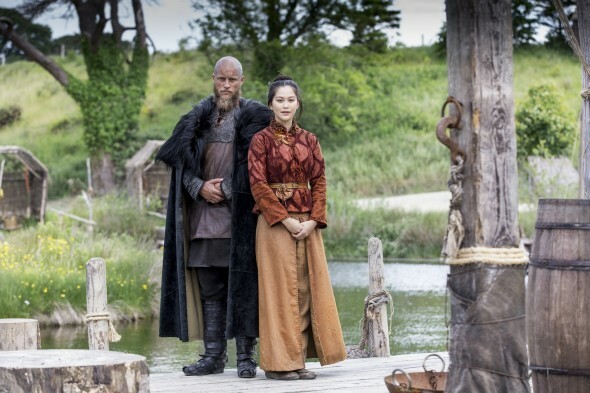 The period drama follows Ragnar Lothbrok (Travis Fimmel), a Viking warrior and farmer who yearns to explore (and raid) the distant shores across the ocean. The cast also includes Katheryn Winnick, Clive Standen, Gustaf Skarsgård, Alyssa Sutherland, Linus Roache, and Alexander Ludwig. Season four will return on Wednesday, November 30th, at 9 p.m. ET/PT. What do you think? Do you watch Vikings? Are you looking forward to the new episodes? I love the show, I hope Travis is still around he’s a great actor and so is Rolo. Great series. Wonder if Queen Elizabeth watches since it involves the history of her country and that she is thought to be descended from Rollo by way of William the Conqueror. Wish there was more on those wonderful boats that got the Vikings where they wanted to go – to the new world with Leif Erickson and to Byzantium by way of the Russian waterways.. .